President-elect Trump’s unfolding space policy will refocus NASA efforts away from exploring Mars to mining valuable minerals from the asteroid belt and visiting Jupiter’s “ocean-moon” Europa, perhaps the best place to find alien life near Earth. In 2013, huge active plumes containing water vapor being released from the surface of Jupiter’s moon Europa were discovered shooting up 1200 kilometers. This sensational find was made using the NASA/ESA Hubble Space Telescope. Europa has been a focus of extraterrestrial research for some time, as there were clear indications that it harbors a liquid vast ocean beneath its icy crust. The plumes were not sighted again, however. 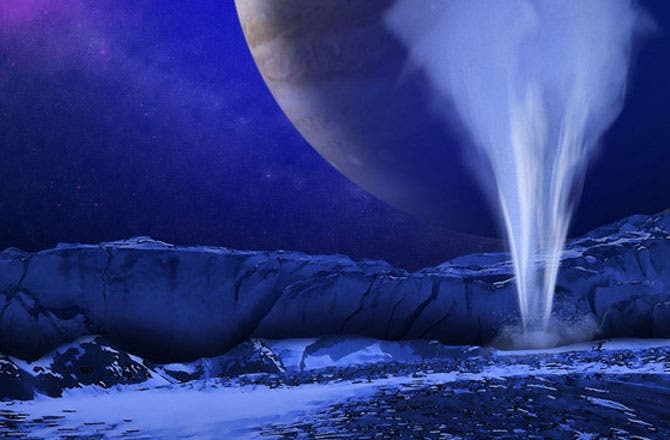 The involvement of Hubble raises the possibility that Europa’s elusive plumes may finally have been spotted again. The key to NASA’s map of search for life in our solar system is to “follow the water.” When Obama took office, he told NASA to concentrate on sending humans to Mars in the 2030s. Mars is a primary target in the search for life outside Earth, and liquid water is the most important pre-requisite for life. But Mars has undergone a billion-year drought. Evidence shows that more than 3 billion years ago Mars was wet and habitable. However, the latest research reaffirms just how dry the environment is today. For life to exist, it would need to find pockets far beneath the surface, located away from the dryness and radiation present on the ground. Trump’s new space plan, still a little short on details, focuses on eliminating bureaucratic waste, promoting a private-public partnership, and setting ambitious goals for NASA that will force the agency to stretch itself. Shortly before Election Day, the new president-elect recruited former Republican congressman Robert Walker, who chaired the Science, Space, and Technology Committee in the 1990s, to help draft a plan for NASA. Trump’s new space policy, as revealed by Walker, is designed to coordinate public and private efforts to maximize American efforts to explore the entire solar system, which includes mining valuable minerals from the asteroid belt and visiting Jupiter’s moon Europa, perhaps the best place to find alien life near Earth. Trump also plans to bring back the National Space Council, last in operation under George H.W. Bush, explore deep space, and encourage commercial partners to build a new economy in low Earth orbit, Walker told Mother Jones.